A version of this article appears in the Summer 2018 issue of Home Energy Magazine. The Middle East—and especially Dubai—is known for its excesses. You visit Dubai to see the world’s tallest building, indoor ski slopes, exotic cars, and huge, air-conditioned shopping malls. What you don’t expect is the world’s most advanced energy-efficient technologies. Here are the facts. The Dubai Lamp is a product line of LED-based advanced lightbulbs. The largest is just 3 watts and emits 600 lumens, for an amazing efficacy of 200 lumens per watt. To appreciate the improvement in efficiency, this light draws only one-tenth of the power of its 60W incandescent ancestor—which many of us still have in our homes—while providing the same illumination. The other lamps have even lower power consumption and come in various shapes and sizes. These lamps are made by Philips, a European company, but are available only in Dubai. I bought ten of these lamps in a big-box store while visiting Dubai. Not for my personal use—they’re designed for 230 V and 50 Hz mains power—but to carry to Europe for more careful examination and testing. The government of Dubai made an exclusive agreement with Philips, basically requiring the Dubai lamp to be installed in all new buildings for several years. It’s a peculiar agreement and sure to cause installation headaches, because this small family of lamps cannot possibly meet all of the common applications. I could not get the whole story on this exclusive tie-up between Philips and Dubai, and I can’t explain why the lights are not available elsewhere (even at a higher, possibly unsubsidized, price). But the lamps are widely available in Dubai, being purchased, and saving energy. Dubai aims to install two million of these lamps each year, which is a lot for this small state. There are so many questions to be asked and lessons to be learned from the Dubai Lamp. 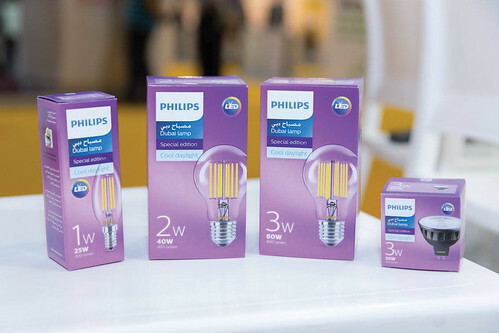 Who would have expected the world’s most efficient, commercially available lightbulb to be sold first in Dubai? In fact, the United Arab Emirates—Dubai is one of seven emirates in the UAE—has undertaken several aggressive energy efficiency programs in support of its Paris climate goals. So one lesson is that efficiency innovations—technical and institutional—can appear in unexpected places. Don’t just assume that the United States is ahead of everybody else. Indeed, the United States is going to join the Third World in efficiency if we don’t find ways to promote these kinds of technologies and improvements in our economy. Learn more about the Dubai Lamp at Philips Lighting Middle East. The Dubai Lamp also illustrates the enormous energy savings still possible through improved efficiency. If 90% reductions in lighting energy can be achieved, what’s next? Cooking? Clothes washing? Desalination? With these kinds of reductions in energy demand, meeting these requirements with renewable energy becomes more widely feasible and economically attractive. Dear Friends, Welcome readers and attendees at the 2019 National Home Performance Conference and Trade Show! Have you heard our news? It is with great excitement that we announce the launch of the Building Performance Association!